Today's route used to take two days but, thanks to the Chinese road building programme, now it can be done in one hop missing out a particularly dirty home stay. So, a long day (450km) on good roads. There was plenty of interest along the way; Tibetan wedding, Yaks swimming across a river, filming for a Chinese pop video to name a few. Despite the god roads today was a day for bike carnage. Kevin got a puncture, Alan's rear suspension collapsed (who ate all the pies Al?) and Stevie Love's fuel pump expired. So a lot of fettling to do this evening. The last 100km was through a tighter valley with peaks rearing either side and forbidding rain clouds overhead. Add heather and swap the yak for heeland coos and you could have been in Glen Coe. 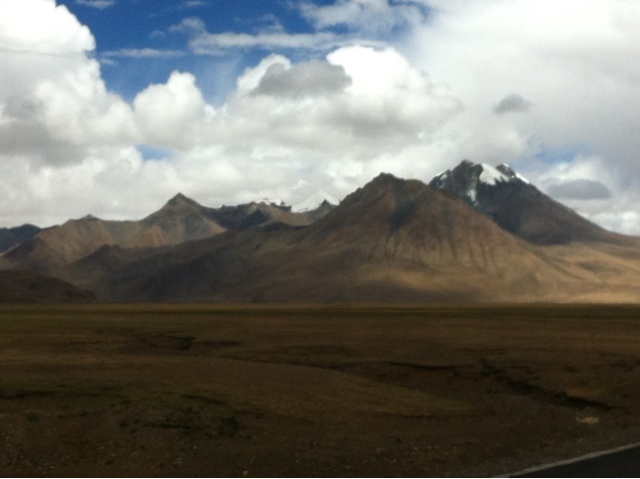 Except 4800m higher up. Tonight we reached Saga. They are replacing the sewers and water system here so every road is dug up and it pings a bit. Water is available from 8:00 to 10:00 so there was a dash for the showers after dinner. A long and eventful day that brings us one day closer to the literal high point. Mount Everest the day after tomorrow.